(1) In General. On notice to other parties and all affected persons, a party may move for an order compelling disclosure or discovery. The motion must include a certification that the movant has in good faith conferred or attempted to confer with the person or party failing to make disclosure or discovery in an effort to obtain it without court action. (2) Appropriate Court. A motion for an order to a party must be made in the court where the action is pending. A motion for an order to a nonparty must be made in the court where the discovery is or will be taken. (A) To Compel Disclosure. If a party fails to make a disclosure required by Rule 26(a), any other party may move to compel disclosure and for appropriate sanctions. (iv) a party fails to produce documents or fails to respond that inspection will be permitted—or fails to permit inspection—as requested under Rule 34. (C) Related to a Deposition. When taking an oral deposition, the party asking a question may complete or adjourn the examination before moving for an order. (4) Evasive or Incomplete Disclosure, Answer, or Response. For purposes of this subdivision (a), an evasive or incomplete disclosure, answer, or response must be treated as a failure to disclose, answer, or respond. (5) Payment of Expenses; Protective Orders. (iii) other circumstances make an award of expenses unjust. (B) If the Motion Is Denied. If the motion is denied, the court may issue any protective order authorized under Rule 26(c) and must, after giving an opportunity to be heard, require the movant, the attorney filing the motion, or both to pay the party or deponent who opposed the motion its reasonable expenses incurred in opposing the motion, including attorney’s fees. But the court must not order this payment if the motion was substantially justified or other circumstances make an award of expenses unjust. (C) If the Motion Is Granted in Part and Denied in Part. If the motion is granted in part and denied in part, the court may issue any protective order authorized under Rule 26(c) and may, after giving an opportunity to be heard, apportion the reasonable expenses for the motion. (1) Sanctions Sought in the District Where the Deposition Is Taken. If the court where the discovery is taken orders a deponent to be sworn or to answer a question and the deponent fails to obey, the failure may be treated as contempt of court. If a deposition-related motion is transferred to the court where the action is pending, and that court orders a deponent to be sworn or to answer a question and the deponent fails to obey, the failure may be treated as contempt of either the court where the discovery is taken or the court where the action is pending. (2) Sanctions Sought in the District Where the Action Is Pending. (B) For Not Producing a Person for Examination. 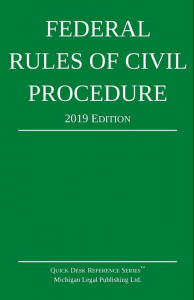 If a party fails to comply with an order under Rule 35(a) requiring it to produce another person for examination, the court may issue any of the orders listed in Rule 37(b)(2)(A)(i)—(vi), unless the disobedient party shows that it cannot produce the other person. (C) Payment of Expenses. Instead of or in addition to the orders above, the court must order the disobedient party, the attorney advising that party, or both to pay the reasonable expenses, including attorney’s fees, caused by the failure, unless the failure was substantially justified or other circumstances make an award of expenses unjust. (C) may impose other appropriate sanctions, including any of the orders listed in Rule 37(b)(2)(A)(i)—(vi). (d) Party’s Failure to Attend Its Own Deposition, Serve Answers to Interrogatories, or Respond to a Request for Inspection. (ii) a party, after being properly served with interrogatories under Rule 33 or a request for inspection under Rule 34, fails to serve its answers, objections, or written response. (B) Certification. A motion for sanctions for failing to answer or respond must include a certification that the movant has in good faith conferred or attempted to confer with the party failing to act in an effort to obtain the answer or response without court action. (2) Unacceptable Excuse for Failing to Act. A failure described in Rule 37(d)(1)(A) is not excused on the ground that the discovery sought was objectionable, unless the party failing to act has a pending motion for a protective order under Rule 26(c). (3) Types of Sanctions. Sanctions may include any of the orders listed in Rule 37(b)(2)(A)(i)—(vi). Instead of or in addition to these sanctions, the court must require the party failing to act, the attorney advising that party, or both to pay the reasonable expenses, including attorney’s fees, caused by the failure, unless the failure was substantially justified or other circumstances make an award of expenses unjust. (f) Failure to Participate in Framing a Discovery Plan. If a party or its attorney fails to participate in good faith in developing and submitting a proposed discovery plan as required by Rule 26(f), the court may, after giving an opportunity to be heard, require that party or attorney to pay to any other party the reasonable expenses, including attorney’s fees, caused by the failure.